While we were gone on vacation our neighbor was nice enough to check in on our cats. He’s got two cats of his own, which makes it a pretty good deal. When he goes out-of-town, we take care of his cats. And when we go away, he makes sure ours haven’t eaten each other. But I still try to find a way to thank him, which usually includes making something sweet as a special thank you treat. The other day when I saw him he was pretty insistent on not wanting any tasty goodies, complaining that he needed to cut back on all the sweet and salty snacking. I’m quite familiar with the brownie mix you can get from one of my favorite stores, which is low in calories and made with yogurt instead of butter or eggs, and figured I could make my own – but with less sugar and flour. I played around with the ingredients and came up with something really dark and rich without all those big calorie and carb players. Because these little goodies are low in sugar and flour, they have a big cocoa flavor – so toss in some extra honey or agave if you want something really super-sweet. Preheat your oven to 350F and get out a mini muffin tin. Now go ahead and measure and add all the dry ingredients (cocoa, flour, baking soda, baking powder, and salt) and give a good stir making sure to break up all those bits of cocoa. Measure and add the rest of the stuff and give a good stir, making sure there aren’t any clumps, creating a nice and thick batter. It’s that easy. Grease your tins with spray or veggie oil (this recipe will fill two mini (or regular size) tins) and then scoop and drop a small spoonful of batter into each open spot. Pop the dark chocolate brownie bites into the oven for 12-15 minutes. Once the tops are nice and toasty, they’re good to go. If you prefer cake-ier brownies, let them hang out in the oven for a couple of minutes longer. Remove the goodies and let cool in the tins for 5-minutes and then slide slide the dark chocolate brownie bites out with a butter knife. This recipe makes about 24 mini brownie bites, perfect for snacking or an after dinner indulgence. Do you know how what the nutritional content of these are? I shared the recipe with some friends, and they were asking. I don’t know the nutritional content off the top of my head – but I’ll look into it and include a breakdown later. Thanks for asking! I found the recipe awful. I had to adjust it by adding a total of 5 tbls vegetable oil and 1/4 cup of coffee for the batter to even resemble brownie mix. I also reduce the temperature to 325 degrees and cooked for 15 minutes. The recipe makes 21 mini brownies. The brownies as I made them were light and delicious. More souffle texture than brownie texture. Sorry you didn’t care for the texture, Suzanne! But, I’m glad you adjusted to fit your taste. 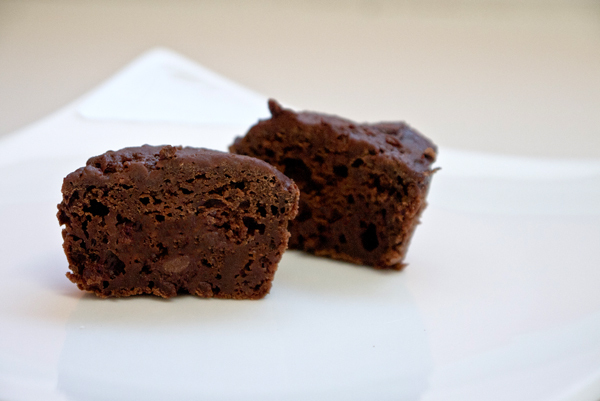 I’ve made this recipe several times and agree that it is a very, thick batter, but once scooped and baked in the mini muffin tins, creates a nice and dark brownie bite. I calculated the Weight Watchers Points and it comes out to 3 points per brownie bite if that helps your readers, using my ingredients. Using yours would be less. This is of course, unofficial, but I used the Points calculator on their website.